THE KING-SIZE CHOCOLATE BAR has been unceremoniously de-throned, giving way to its leaner, more PC (proportionally-correct) stable-mates in the confectionery world. Like many others carrying some excess weight, King-Size Chocolate Bar has succumbed to pressure from health experts to cut down on the fat. For some years it had been happy with its portliness, offering that bit extra to those in need of something more than the standard size can deliver, not to mention its diminutive Fun Size sibling. However, health watchdogs felt its bumptiousness was seducing the weak-willed into eating more than they actually wanted. Friends may have foreseen its fate when a recent government report showed a King- Size Snickers bar had more calories than a meal of sirloin steak, potatoes and broccoli. It nevertheless tried to remain defiant in the face of criticism, putting the nation's rapidly expanding girth down to a lack of willpower rather than its own plump proportions. But it finally fell victim to those pushing a healthier agenda and its downsizing is a goodwill gesture on behalf of the chocolate manufacturers - Nestle excepted - who are trying to show they have customer health at heart. 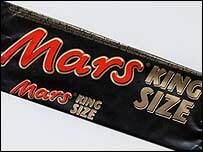 The big bars have been given a stay of execution until next year by Cadbury and Masterfoods - makers of Mars and Snickers - who will then expect them to get into shape with the rest of the confectionery industry. Fairwell. We'll (work, rest and) pray for you. Work, play and rest in peace. A minute on our lips, a lifetime on our hips, and always in our heart. I propose we build a Marsoleum.